One of the most important things you can do for your home, and the environment, is to have your home properly insulated. By having one of MVP Builders’s insulation contractors install proper insulation in your home, it can result into a wise investment. Our insulation contractors are all about finding a solution to your energy efficiency needs. MVP Builders will begin with an insulation contractor coming to your home to inspect certain area of your home where you may be potentially losing heat or cool air. We will then give you an estimate and some recommendations as to what to part of the project is a main priority. Our insulation contractors know that each insulation need is unique and specific, which is why they will be happy to discuss all the specific needs your home requires and will help you choose an installation method that is best for your home. Loose-Fill Insulation — This type of insulation is typically made of cellulose, fiberglass, or rock wool in the form of fiber pellets or loose fibers. This is the ideal insulation is effective in places of the home where there is difficulty installing insulation. Foam Insulation — Our insulation contractors will use this method in order to reduce any type of air leakage that can be coming from window and door frames. Rigid Foam Insulation — This type of insulation is used for attics, and interior and exterior wall sheathing. Rolls and Batts — This type of insulation is flexible and can be made with with fiberglass or rock wool. Proper insulation installation will result in energy saving benefits for you, as proper insulation helps your home retain heat in the winter time and keep it cool in the summer time. Since heat and air are no longer escaping your home, you get to save a bundle on your utility bills. As a result, your home will be reducing its carbon footprint by being energy efficient. 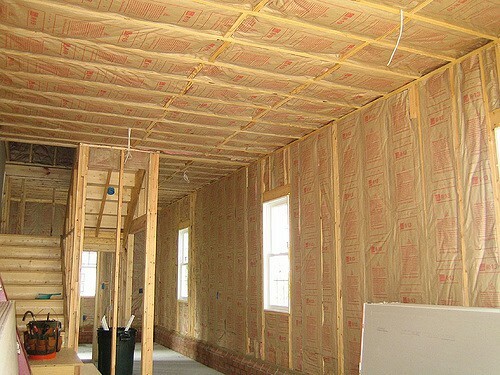 MVP Builders’s insulation contractors are certified to handle all your home improvement needs from the beginning of the project, until it is completed. With constant communication, we will ensure that you are informed of proper energy saving tips every step of the way. Properly insulating your home is the best way that you can reduce your energy consumption and reduce your carbon footprint. MVP Builders will work with you on improving your home.